There are two major attitudes towards ‘executing architecture’: designing architecture as a space, and designing architecture as a product. Many architects and studios in the schools emphasise ‘architecture as space’. Taking the proverb, ‘the use of the bowl is in its void’, for example, they tend to denigrate morphism and functionalist architecture in favour of a ‘sense of place and atmosphere’ that is often difficult to define. However, these two attitudes are not superior, opposite, nor incompatible. Those who speak of architecture as space place their weight on history, memory, tradition, context, place, and so on, and those who design architecture as a product concentrate on function, performance, form, material, technology, tectonics and details. The architecture of the former is usually studied through perspective drawings, the hand sketches of the architect, and the latter is usually expressed through bird’s-eye views, isometrics, and exploded drawings. Of course, the former is more interested in sensitivity and the artistic, and the latter is more interested in reason, technology, and the scientific. Throughout the era of modern architects there was an enthusiasm about new machinery and the advancement of capitalism, whereas now Korean architecture seems to talk about space but in reality it is often focused on the product or commodity. The modern-style buildings in a prestigious architecture magazine also boast the concept behind each, but this is similar to an iPhone, Galaxy, Huawei or Xiaomi phone displayed in a store showcase as different brands. When it comes to commercialisation, it is not easy to be distinctive because they are required to be fashionable, designed and built at a faster and faster pace, and constructed to achieve maximum performance at minimum cost. 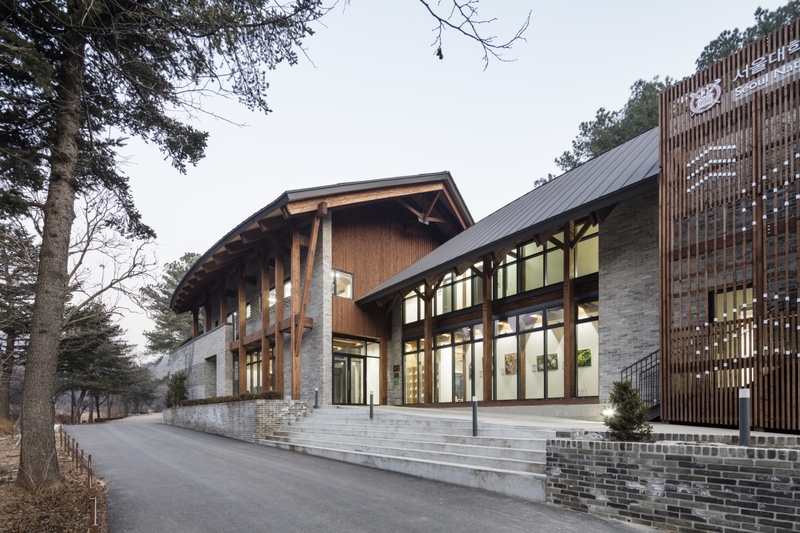 The situation at the time of designing the Gwanak Arboretum Education & Management Building, constituted of a client-less, short design period, an insufficient construction budget, and the complicated selection of the contractor, was hard to figure out due to the blind bid by Public Procurement Service, which was not different from that stated above. The biggest idea that arose during the design phase of this building was that it should not be architecture that is biased towards only the creation of either a space or a product. Therefore, in order to devise architecture as a spatial experience, the reinterpretation of Korean traditional architecture was adopted, and digital design and fabrication was used to cope with the sense of architecture as a product. As historical record, architecture should not only partake in the mainstream culture of its time but also identify with advanced technology. Two kinds of technology are usually used in the realisation of a building: the design technology and the construction technology. Architects should select design technologies with construction technologies in mind. More recently, in terms of architectural production, the maximum amount of factory fabrication is increasingly required along with the minimum amount of on-site construction for ‘architecture as product’. 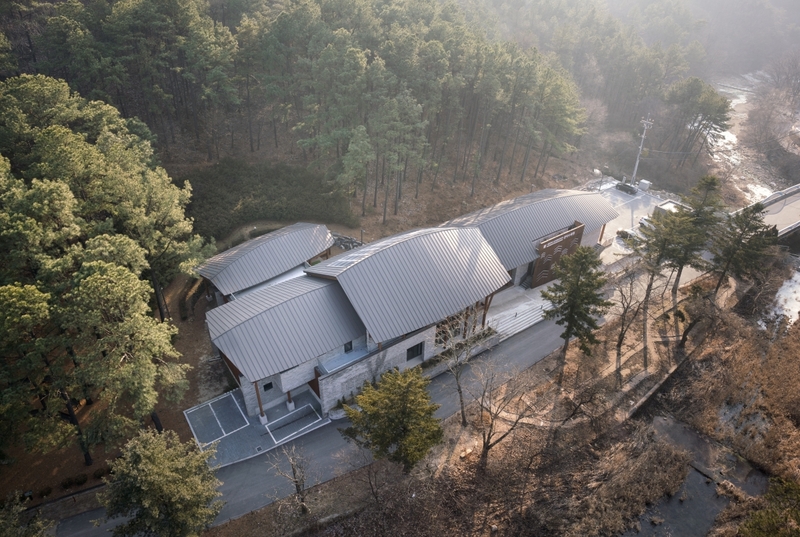 Since the Gwanak Arboretum Education & Management Building was located in the heavily-wooded mountain area, rather than in an urban context, lean construction, which minimises on-site construction, was considered as one of important factors from the beginning. For this purpose, instead of a reinforced concrete structure, which requires a lot of construction equipment on the field, they adopted a lumber structure, which was the inevitable decision to match the status of a building for the study and cultivation of plants and trees. 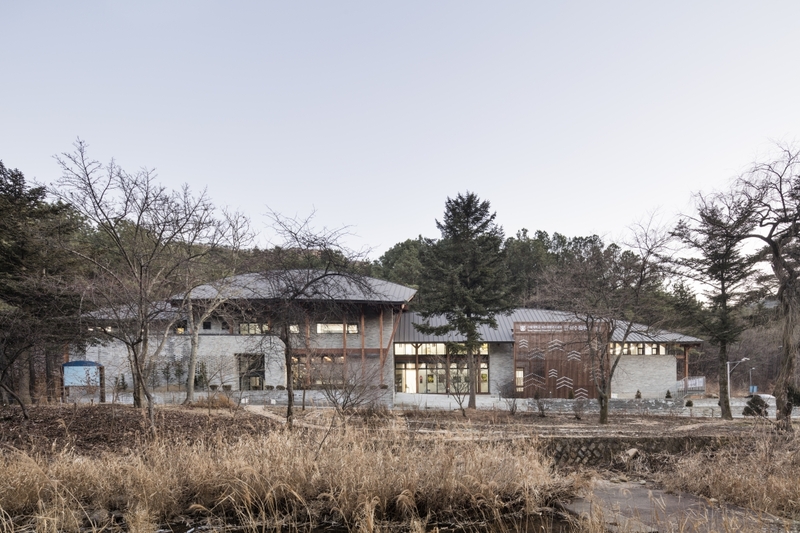 In designing this lumber structure building, numerous formative studies had to be executed to realise the natural curved roof line resembling the Gwanak Mountain ridge. We used a parametric design modeling technique with a Grasshopper plug-in, primarily because it is almost impossible to study an atypically shaped lumber structure building consisting of various types and sizes of elements only with 2D drawings and physical models. For the four-roof structure approximately 40 variables were assigned to each roof, and hundreds of roofs were tested by varying their values over a short period of time. 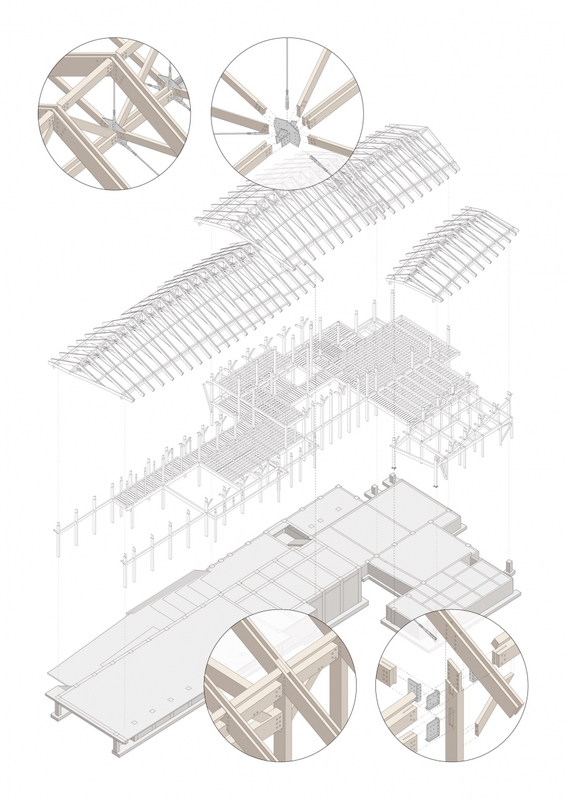 In addition, we developed the logic that automatically generates the structural frame, its connective detailing, and a list of elements as soon as the shape of the roof has been determined. At the design stage, not only the design work but also various other matters required for construction were determined in advance through virtual simulations, so that it would be possible to reduce significant amount of trial and error, production time and cost. This shows how we have reached a point in which the virtual world and reality interact, and can be reflected in the design process of this building. You can start with a unit and populate a space to build a system. On the contrary, you can decide upon a huge relational framework first and fill it with small units. This is what modern physics has revealed when pondering and reflecting upon the structure of the universe and the meaning of life.▼1 In order to create an architecture that is more harmonious with the very Korean nature of Gwanak Mountain, we borrowed a spatial composition from Korean traditional architecture – a temple or seowon - which is located in similar environment. 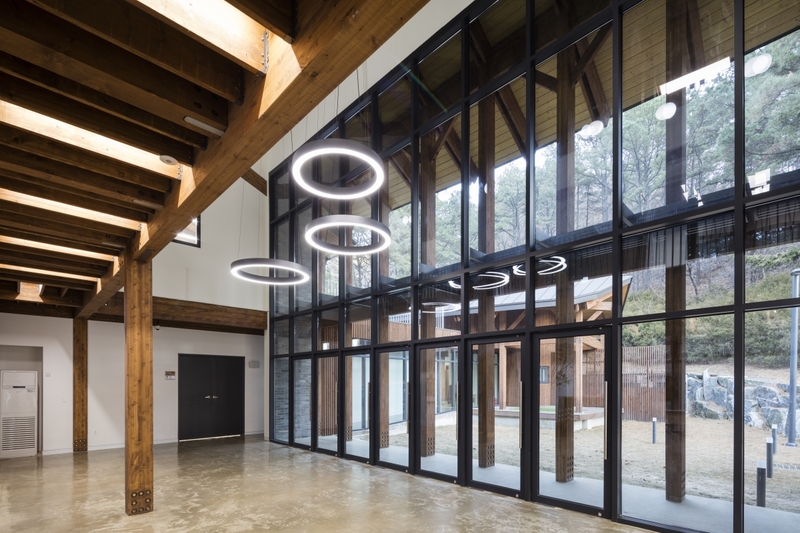 The Gwanak Arboretum Education & Management Building begins with a unit of spatial composition called a ‘toi’, ‘kan’ made by the members of the lumber structure unit. These units are gathered to form ‘che’, and the way in which ‘che’ accumulate to make a building is a strategy which can be easily adapted to a local context by resonating with the concept of the ‘Unit’ and ‘Field’. Zo Hangman studied at Seoul National University and GSAPP of the Columbia University. 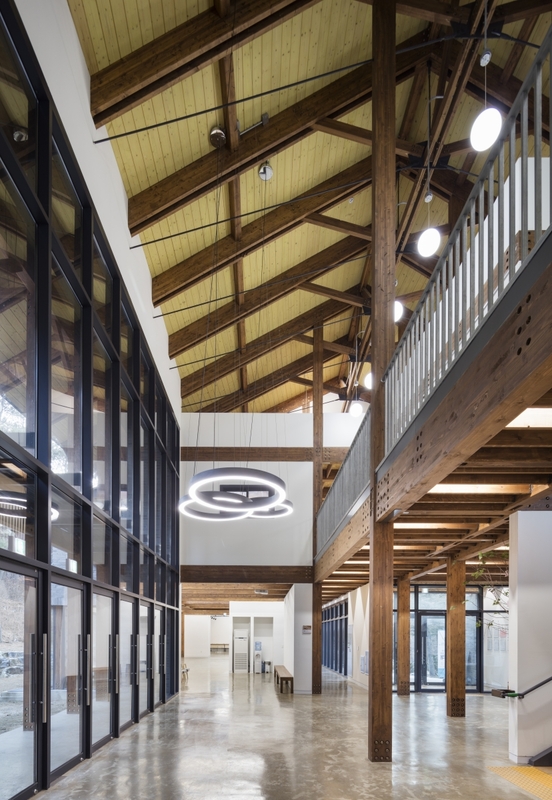 After practicing in KYWC Architects, iArc Architects, Seoul and GreenbergFarrow Architecture, New York, he joined H Architecture, P.C., New York, upon its founding as a Design Principal, and designed and managed various projects. He is a professor at DAAE, Seoul National University from 2013, and co-operates TAAL Architects with his partner Jiyoung Seo. Notable works include the Master Plan of Public Administration Town in Sejong City, Sejong Government Complex 1-1, 2-2, 2012 Yeosu Expo International Pavilion, Korea Hydro & Nuclear Power Gyeongju Hwabaek Convention Center. He has received numerous awards including the 2010 WAN Award Building of the Year, the AIA NY Design Award (2009, 2010), the Kim Soo Keun Preview Prize (2016), and the Korea Wood Design Award (2018).